Then it is time to choose the colour/finishing and the diameter on the product page. Here are some tips. Our poles come in many different finishes. Chrome – The most common finish on a pole, it is good in all weathers. However it does wear over time due to usage. Works great as a standard pole. Chrome poles are more cost-effective than Stainless Steel. Stainless Steel – Great for those who suffer from metal allergies, however is very weather dependent. Stainless Steel is perfect for users who struggle or have allergies with materials such as chrome. The stainless steel pole comes polished, making it great for spins and when performing inverted tricks. This material is at its optimal state in humid conditions and is very popular in the USA. It is used in studios a lot more than in homes as the material is more durable and hard-wearing than chrome. There is no risk of rust. Titanium Gold – Is electronically coated for an enhanced grip. This is done on top of the Chrome to attain this finish. The Gold will wear over time, even though this does not affect the grip, the colour of the pole may vary over time. Powder-coated Poles - Powder-coated poles are very sticky and is only recommended for those who struggle for grip on our traditional metal poles. 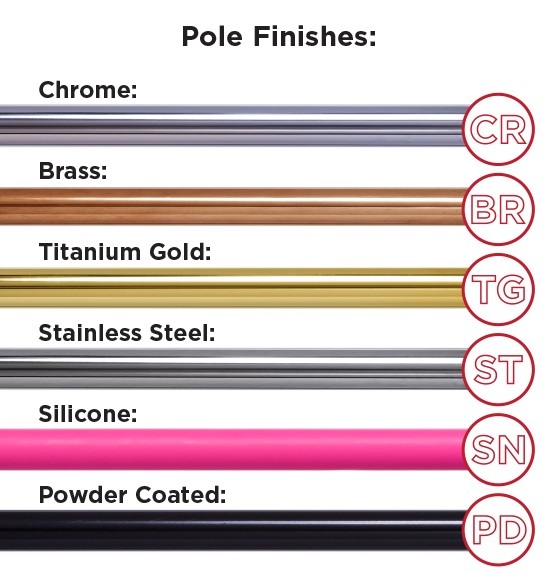 If you have experienced problems such as slipping when trying to execute moves or climbing the pole, try powder-coated poles for improved grip compared to a Chrome/Brass/Stainless. The surface finish is very grippy and has a very smooth texture (not rippled) which many users love. Also, powder-coated poles provide more colour selection, such as black, white and pink. Silicone – Used on Chinese pole. You can pole with long sleeves and long pants on, so it is a great choice for cold countries, kids and men’s classes; and various other pole acrobatics. This is great for beginners who want to build up their strength and professionals who need to perform in long sleeves and long trousers as costumes. The silicone material is a Hi-Grade material used in medical industries. The silicone is permanently fixed to the pole and is not removable. The choice of pole material is very weather dependant, for instance if the climate is very humid and wet (for example by the beach) then the chrome is likely to rust, the brass would be slippery, so stainless steel would be the best. If you live in a hot country then brass is best for you as brass becomes grippy when warm. If in a normal environment (EU, UK) chrome is great. Again, it depends on the location and room ventilation and other conditions, for example, your studio may be in the EU, but the inside environment may be hot and humid. Each pole is very personal as well! It all depends on how your body reacts to working out and how the skin reacts to different metals. 40mm poles are advantageous if you have small hands so you can have better grip on the pole. 42mm poles are currently only provided by Lupit Pole. Good for small hands. 45mm poles are the industry/competition standard. This is the bestselling pole size. 50mm poles have a larger surface area and provide more grip with all body parts. That means some poses that require grip from the elbow or the knees can be held longer. It is also easier to change from a thicker pole to a thinner pole, as your grip strength is enhanced the more you practice on a thicker pole. This was the original pole size that was introduced to the industry when it all first started. XPert Pole by XPole Our no. 1 Bestseller. Pro XPert Pole by XPole Latest product release by XPole in 2018. An upgrade from the XPert Pole with the X-Lock. Lupit Pole in 45mm Chrome / Stainless Steel Latest product release by Lupit Pole in 2018 with standard 45mm diameter and chrome finishing. Lupit Pole in 42mm Stainless Steel Original product by Lupit Pole. Made in EU for superior quality.